I may have committed a cardinal sin when I donned an African witch doctor costume I concocted for Halloween in New York’s Greenwich Village, and stepped onto the streets of Port of Spain with the intention to play mas—without joining a band. That was in 1992 at my first Trinidad Carnival. I was on assignment for a newspaper and figured the truest candid shots of the release Carnival induces are captured from within the mas. It was difficult to be incognito amidst the laughter my costume evoked. 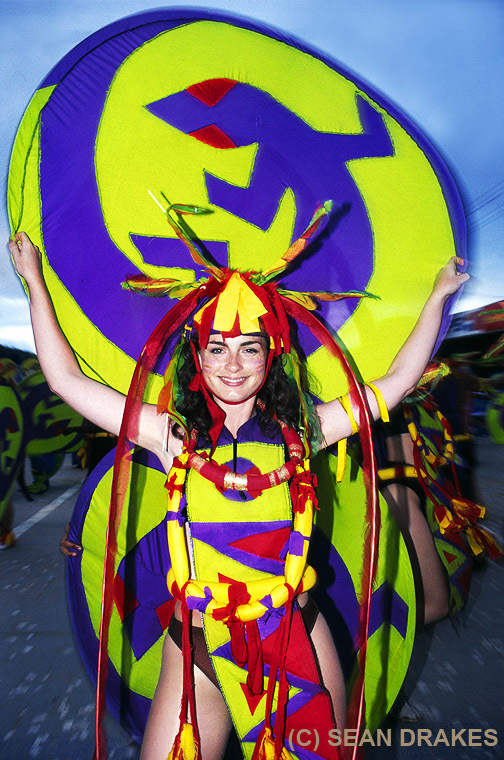 The best thing to come of that Carnival experience was my encounter with the mas band designed by Peter Minshall. That year he produced Barcelona – Port of Spain, a symbolic reference to Trinidad’s monumental presence at the Olympic Games in Barcelona. 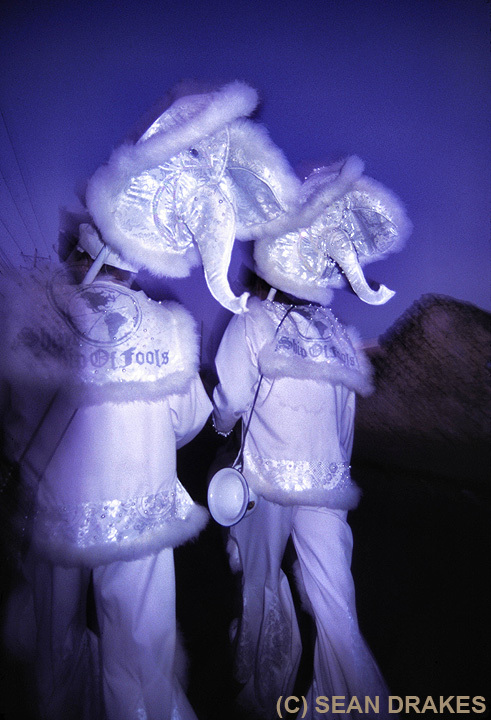 The band was vibrant and lighthearted, the masqueraders graceful, and the energy infectious. I was eager to be part of that artistic collective. I have portrayed a Minshall mas many ti mes: Donkey Derby, The Odyssey, Song of the Earth, Tapestry, Red, M2K, Picoplat, Ship of Fools. When Minshall embarks on designing his goal is to create mas that is kinetic, “that channels and expresses the spiritual and physical energy” of the masquerader. There’s little that’s unknown about Minshall’s devotion to using mas as a medium to reflect on and respond to the state of affairs and political turmoil in his adopted homeland, and to empower his countrymen to dramatize his provocative narratives. Minshall’s darkest bands: Danse Macabre, Rat Race, Jumbie, Sans Humanite, This is Hell offered poignant and critical commentary on the chaos, dis-ease and despair of the time. There’s usually an epic poem or epic battle at the heart of a Minshall effort to arouse the consciousness of the citizenry. Born in Georgetown, Guyana, Minshall, now 68, was a child when his family migrated to Trinidad. Minshall studied theatre design at the Central School of Art and Design in London and was igniting a propitious career in theatre arts when he was summoned to Trinidad’s Carnival. A career-altering moment occurred in 1974 when Minshall’s elaborate hummingbird mas entitled “From the Land of the Hummingbird”, portrayed by his stepsister Sherry Ann Guy, delivered a triumphant performance. Two years later, Minshall designed his first full-size band for bandleader Stephen Lee Heung…the rest is the legacy millions have watched unfold. Minshall resides with distinguished company as one of the most acclaimed theatrical performance designers on the planet. Highlights of his career beyond Trinidad’s Carnival include: The 1985 Adoration of Hiroshima, a nuclear protest mas staged in Washington, D.C. He co-designed and directed spectacular ceremonies for the 1992 Barcelona Olympics, 1996 Atlanta Olympics and 2002 Salt Lake City Winter Olympics. And he collaborated with French composer Jean-Michel Jarre on the Concert For Tolerance in 1995. What does creating mas do for you that no other medium could? Which mas band in your repertoire do you wish you could do-over partially or in its entirety? Oftentimes the message in your mas ignites controversy…that’s not intentional, right? What would be the theme of the dialogue you would like to witness happen among emerging and established bandleaders? What is your offering to fellow masmen trying to keep the festival viable? With play writing are you pursuing a dream deferred, give me a snapshot of the plot of the play you’re crafting? What part of the world do you dream of exploring, why? What keeps you in Trinidad? Have you retired, if not, what’s next for Peter Minshall?